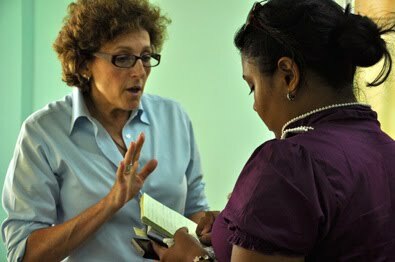 THE MARGARET CLEMONS FOUNDATION (MCF) is pleased to announce that it has partnered with Lesley University to support the government of Guyana in addressing the issue of violence against women and children in Guyana by integrating the arts into teacher preparation, counselor training, and community outreach programs. Lesley University, located in Cambridge, Massachusetts is among the largest providers of teacher education in the U.S., offering among others, innovative interdisciplinary programs in counseling, psychology, and expressive therapies—a field initiated at Lesley. For over 100 years Lesley has prepared its graduates for service and leadership in the fields of education, human services, and the arts. 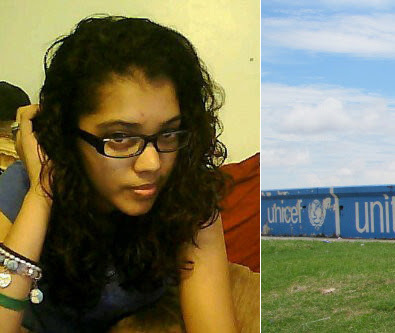 Today Lesley offers programs across the United States (www.lesley.edu) and abroad. 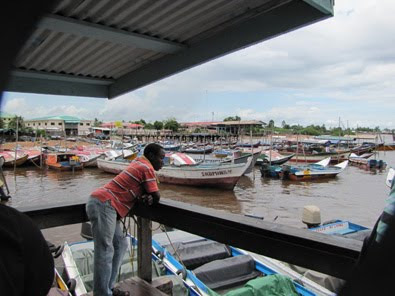 With support from MCF, the government of Guyana and other NGOs Lesley faculty will contribute practical and academic expertise and leadership to areas of need in Guyana and collaborate with MCF to develop sustainable, scalable, replicable models of programming for social change worldwide. 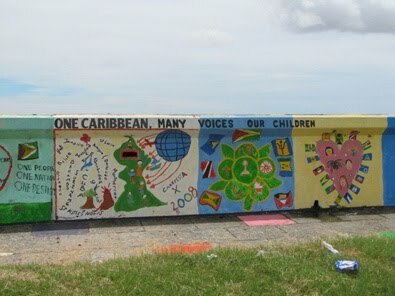 In 2008 UNICEF sponsored an art project at the Seawall in Georgetown to celebrate Carifesta (Caribbean Festival of the Arts) http://carifesta.net/x/index.php?q=history, considered the most important celebration of the Caribbean communities. Margaret Clemons was lucky enough to meet with and interview a young artist, Kimberly Morgan, who participated in the project. 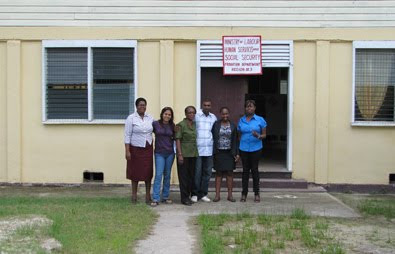 On August 2nd Margaret Clemons traveled to Georgetown, Guyana to meet with stakeholders at the Ministry of Human Services & Social Security and Help & Shelter to discuss the programming scheduled to commence in 2011 and which will include Guyana specific training, including a “train the trainer” model, for school counselors, social workers and social service providers/staff. The training will be designed and delivered by Lesley University core faculty. 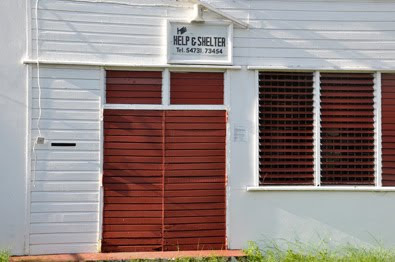 Our week began with a meeting at Help & Shelter with Director Margaret Kertzious. Ms. Kertzious invited us to a confidential tour of their shelter housing women and children and to speak with staff there. At the shelter we were given a tour by senior staff and had a chance to ask questions of staff and volunteers. 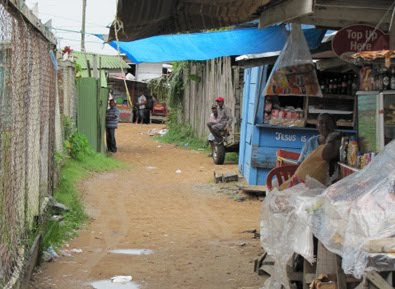 The shelter itself is a warm, clean and safe environment where women and their children can find their footing and move forward in a way that is sustainable. We are delighted to provide support to this organization of dedicated professionals whose efforts on behalf of women and children have been well documented. Help & Shelter called a press conference and invited Guyana’s four main news outlets (Stabroek News, Kaieteur News, Guyana Chronicle, and the Guyana Times) to meet with and hear from Margaret Clemons and Lauren Stevenson and also to meet with the Peaceable Schools attendee from Help & Shelter, Tessa Greene. The press conference provided us a platform from which we outlined our mission and discussed the success of the Peaceable Schools & Communities Institute and the talented Guyanese participants’ contribution to the program in Cambridge. 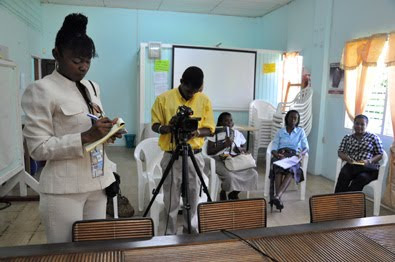 We found that the press was very interested in the fact that the programs for social service providers and educators would be structured as “train the trainer” programs. They also were interested in our ultimate objective of creating a template for changing violent behavior. Check out the links to read the articles. At the Ministry of Human Services & Social Security we met with the Permanent Secretary to the Ministry, Trevor Thomas to discuss MCFs partnership with the ministry and plans for developing programming that would be of the highest relevance and impact for Guyana. This meeting also provided the opportunity to give thanks for the wonderful and talented staff that the ministry sent to the Peaceable Schools & Communities Institute. Mr. Thomas enthusiastically supports the certificate program we will offer to his staff of social service providers. 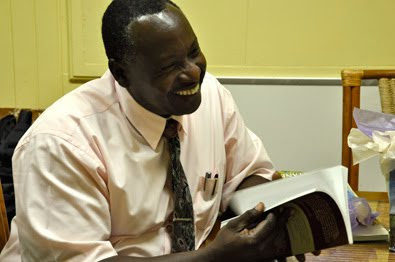 [L1] Lesley & MCF presented Mr. Thomas with two books authored by Ms. Stevenson which she signed for him. 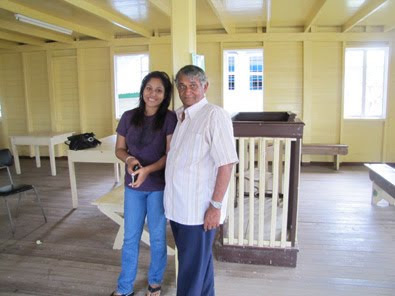 Priya Manickchand’s personal assistant Kamita Johnson interrupted her vacation to meet with us at the Ministry’s office. Ms. Johnson was the “go to” person during the preparations for the Peaceable Schools & Communities Institute and was instrumental in overcoming many of the challenges in bringing the Ministry staff to Cambridge. 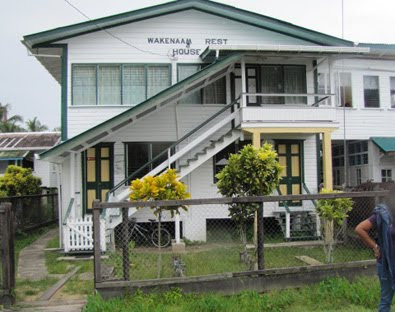 The Ministry graciously provided us with office space during our stay in Georgetown and made arrangements for us to meet the Ministry’s staff in Region 3 (about an hour outside of Georgetown) and the Local Board of Guardians on the island of Wakenaam on the Essequibo River. 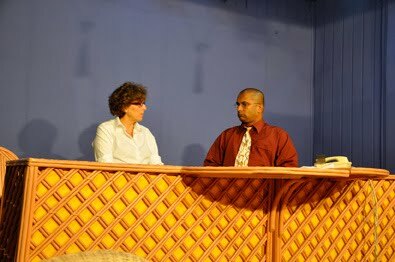 Ms. Johnson also made arrangements for us to appear on the television network NTN’s Morning Show. The following day began early with our appearance on the popular television morning show, NTN NETWORK’s THE MORNING SHOW WITH REYAZ HUSEIN. Here we had an opportunity to introduce our mission, discuss the success of the Peaceable Schools & Communities Institute and outline future programming. Mr. Husein gave us a robust, on-air endorsement and invited us to return to his show for a more in-depth discussion. 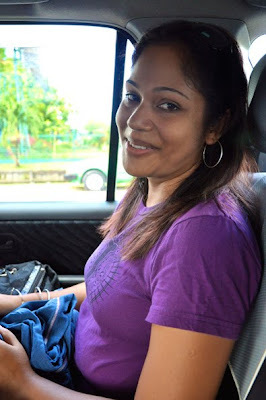 Yogeeta Rampersaud from the Ministry of Human Services & Social Security escorted us to Region 3 outside of Georgetown to meet Ministry staff there. 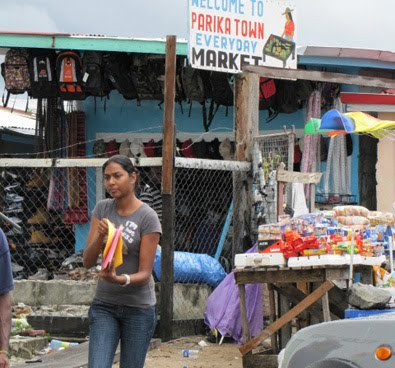 Ms. Rampersaud, who attended the Peaceable Schools & Communities Institute in Cambridge, said that she has already begun to work with her children’s group and four adult volunteers in the techniques that she learned in Cambridge. At the Region 3 Ministry office we were warmly welcomed by all of the staff there that showed us their facility and asked us about future programming. We were invited to spend a day with them to see them attending to the public to help us in developing future training programs. 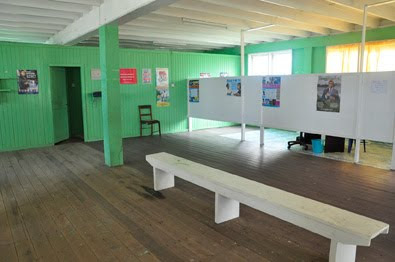 Our next trip to Guyana will include spending a day in the Region 3 office. 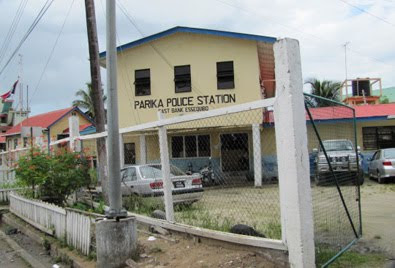 After leaving the Region 3 Ministry’s office we proceeded to the Parika Ferry Stelling to take a boat to Wakenaam on the Essequibo River. 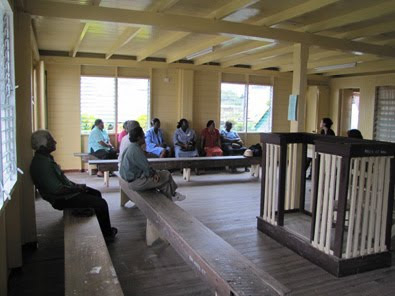 The Ministry had arranged for us to meet at the Magistrate Court with the Local Board of Guardians (community elders from this island of about 12,000 residents) to discuss the issue of violence against women and children and to hear how they perceive this issue. 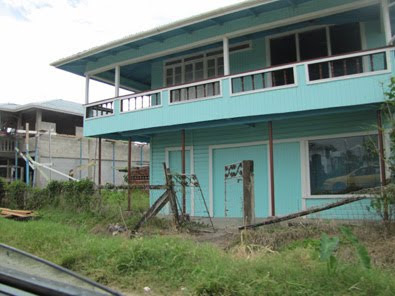 This white clapboard building houses the Magistrate Court in the lower level and a guest house on the second floor. 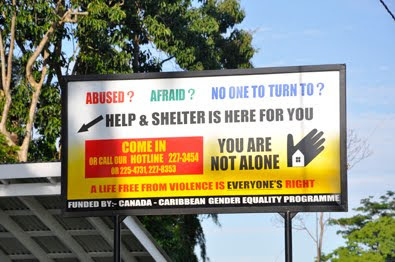 We also discussed with the group possibilities for bringing community arts programming to their and other communities in Guyana to address issues of gender-based violence. The discussion was spirited and we found the group to be knowledgeable and engaged. They listened carefully, told stories, voiced opinions about the issue of violence and embraced the idea of using the arts to change behavior. The meeting was a delight. At the close of the meeting all of the participants signed up to work with MCF to bring arts-based social change programming to their community. We continued at the Ministry of Education where we met with Evelyn Hamilton the Chief Planning Officer for the Ministry of Education and then Olato Sam (technical advisor to Minister Baksh) to discuss programming for the Ministry’s guidance counselors and school welfare officers. These discussions have advanced with Lesley University’s participation and are ongoing. 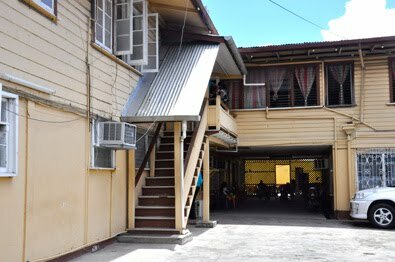 The Ministry of Education made arrangements for us to meet with staff at the Queens College Compound where the Ministry of Education’s “Allied Arts” Unit is located. 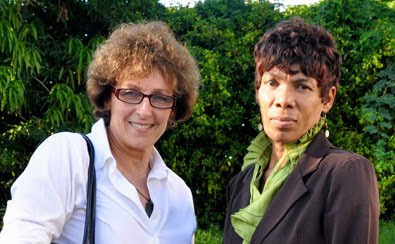 There we met with the Allied Arts Administrator Desiree Wyles-Ogle and her deputy Lorraine Borkum to discuss programming and collaboration. 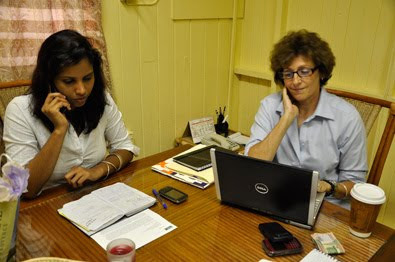 The week ended with a long and fruitful meeting between Minister Priya Manickchand and Margaret Clemons. 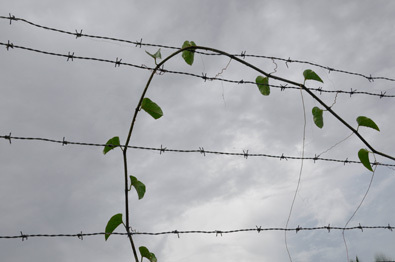 Clemons and Manickchand discussed a range of programming and how these efforts will inform the practice of human services and prepare highly qualified, reflective, and proactive professionals to address one of the country’s most pressing social needs. They also discussed the value of structuring programming in a train-the-trainer model to build the capacity of human service professionals to train others in the methodology and to extend and grow the roots of peace.